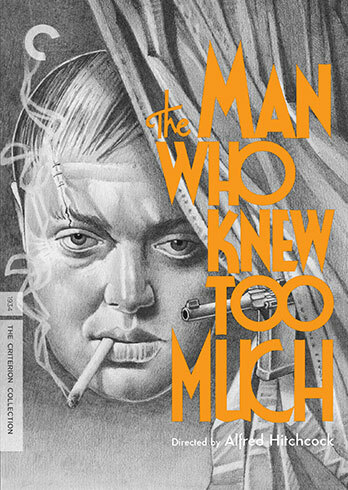 The old bachelor in me would like to watch Alfred Hitchcock's original The Man Who Knew Too Much as a parable about the smart-mouthed tween who learned to mind her manners. 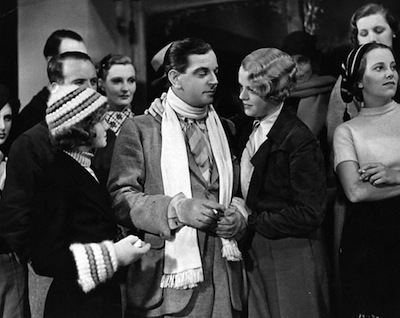 Compare the overly precocious Betty Lawrence, as played by bizarrely named Nova Pilbeam, at the start of the picture to the shaky, defeated Betty in the final scenes. The girl at the start spoils everything, from ruining sports competitions in the Swiss alps to disrupting a nice meal; the girl at the end can barely speak, she trembles so. Say what you want about foreign spies, but they know how to babysit! 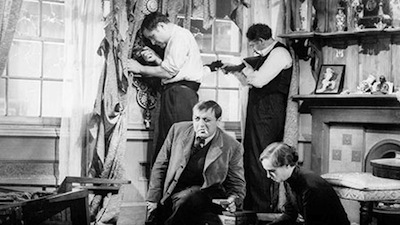 The 1934 suspense picture The Man Who Knew Too Much is often cited as a bridge between early Hitchcock and the later pictures that would earn him his reputation as the Master of Suspense. It is agile and funny, with a lithe tone that readily embraces romance, screwball comedy, and, of course, mystery and danger. Hitchcock would remake the film more than 20 years later starring Jimmy Stewart and Doris Day, but this original black-and-white version stars Leslie Banks and Edna Best as Bob and Jill Lawrence, a well-to-do British couple visiting Switzerland on holiday. There, they befriended Louis (Pierre Fresnay), a charming skier who also happens to be an international spy. When Louis is unexpectedly shot while dancing with Jill, he informs her of a secret document hidden in his room. She sends Bob to fetch it, and he beats the bad guys, but they kidnap their daughter as retaliation. If mom and pop breathe a word of what they found, the girl gets it. Back in England, the police and the secret service are eager to find out what really happened. The absence of Betty has been noted, and Louis' British contact, a man named Gibson (George Curzon), tells them in no uncertain terms that the secret they possess is the key to stopping the assassination of a visiting dignitary. Their lack of cooperation could mean an international incident. Naturally, parental responsibility trumps global politics, and The Man Who Knew Too Much really takes off when Bob and his brother-in-law Clive (Hugh Wakefield) take to the streets to try to decipher the dead man's clue and find the girl. The trail leads them to a dentist's office and then a cult that worships the sun, and they pick up familiar faces along the way. 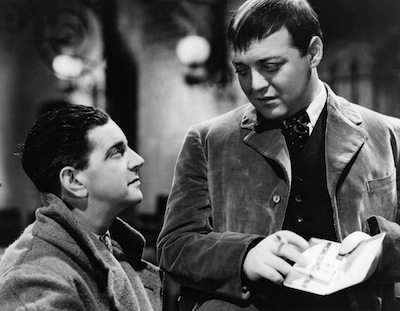 Both a sharpshooter (Frank Vosper) and a funny German traveler (Peter Lorre) they met on holiday are lurking about. These two have been more than they seemed all along. That's actually Hitchcock's first genius move in The Man Who Knew Too Much: for those who maybe weren't familiar with Lorre's more sinister screen persona (namely, in Fritz Lang's M), he would appear to be little more than comic relief in the Swiss scenes. Indeed, the whole opening of The Man Who Knew Too Much, right up until Louis taking a bullet, comes off as a kind of family comedy. The men banter over the woman, the little girl gets up to no good--it's fun and frolic on vacation. 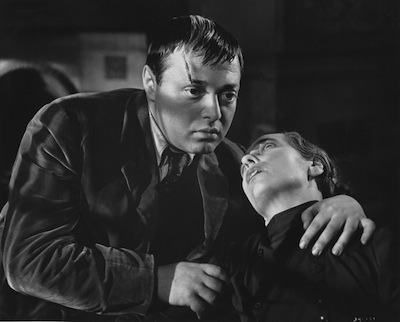 Hitchcock maintains this breeziness throughout the film. Bob is always ready with a quick verbal jab, and Clive serves as a comedy sidekick, going so far as to lose a tooth and be hypnotized for the good of the mission. While these gags relay a kind of stiff-upper-lip, laugh-in-the-face-of-peril resilience, Lorre's character, Abbott, slowly slips from humorous to sinister. He laughs the entire way, but the more we are witness to what tickles his macabre fancy, the more cruel he appears. He's a bad dude, through and through. There is a feeling throughout The Man Who Knew Too Much that Hitchcock is going all out. Apparently this film followed a string of flops, and the director maybe realized he had nothing to lose by making the kind of movie he believed in. His deftness with so many different moods, and his uncanny ability to switch from one to the other without it seeming abrupt or jarring, makes for a film that is imminently entertaining, one that dares you not to look away lest you miss what happens next. At the same time, in the filmmaking itself, we can see the young Hitchcock that was influenced by the German impressionist filmmakers, using light and shadow to put the audience on edge, and forgoing any musical score and letting the sound of the action create its own rhythm. This is a film, after all, where both the music of a pocket watch and a live orchestra provide important plot mechanisms. In the final shootout, the metronymic back-and-forth of the gunfire serves as the counting down of a doomsday clock. There is no one thing that stands out about this go-around with The Man Who Knew Too Much, no special element that makes it more memorable amongst the Hitchcock canon. It's been years since I've seen the 1956 redo, but I do know as a young viewer, I saw that one first, and then I saw the original after, before I had the faculty to understand how to process older films or even the idea that a director would remake one of his own movies for any other reason than he could do it better. Which is the superior version is certainly an arguable point. For as much as a crowd-pleaser as the remake is, complete with an Oscar-winning song from Doris Day, there is something so perfectly entertaining about its ancestor, it really shouldn't be dismissed. The 1934 The Man Who Knew Too Much has no one defining element because all the elements work in concert, aligning exactly as they should to create a whip-smart thriller that stands the test of time all on its own.